Clyde is a blue ex-racing greyhound who was born in June 2014. He weighs 31.8 kg. and has lived in his owner/trainer's home since he injured himself so he is house trained. 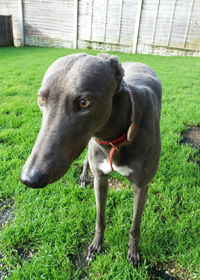 Clyde is a very laid back and kind dog who is good with children, okay with small dogs and could even be cat trainable - he shows no interest in cats or dogs when out walking. walks okay on the lead and travels well in a car. Clyde broke his hock rather badly in a race a few weeks ago. His pot came off on the 9th October 2017 and he's gaining strength in it all the time. This morning Clyde went to the vets to be neutered. All went well and we collected him in the afternoon and brought him home to sleep things off. He was whimpering a bit in his crate in the living room later so we tried him with a bit of food, which he didn't want so we let him out to do his toilet. We put him in a crate to give him peace from the others. He whimpered on and off until we went to bed and the room was dark then he settled. This morning Clyde gave us a lovely greeting when we let him from the crate in the living room to go in the garden to do his toilet. All seemed well and he ate a good breakfast.